This is a reprint of the letter from the editor in Unwinnable Monthly Issue Ninety-One. You can buy Issue Ninety-One now, or purchase a one-month subscription to make sure you never miss an issue! Happy May everybody! Here in Jersey the sun is warm and the breeze is cool. I hope the same is true wherever you may be. This month’s issue is also pretty cool, if perhaps a bit less breezy. In our cover story (dig that art by the amazing Justine Jones! 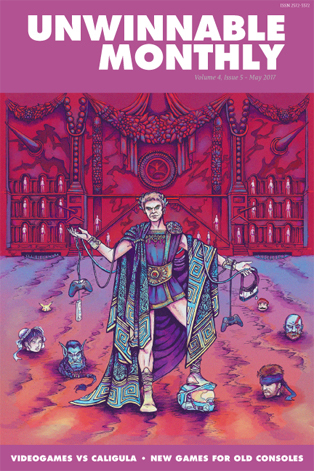 ), Ed Smith argues that everything we need to know about videogames is encoded in the sleazy trashiness of the 1979 Tinto Brass/Bob Guccione production of Caligula. I don’t entirely agree with Ed (I am not sure Ed entirely agrees with Ed, honestly), but I think it is an interesting thought exercise in why we enjoy what we enjoy. 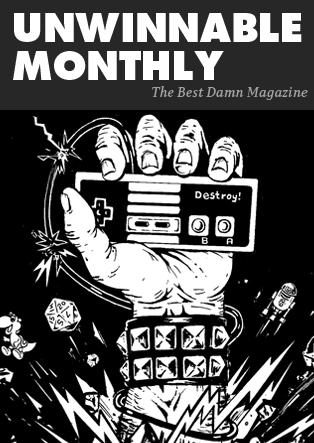 The second feature, by Davis Cox, digs into the return of physical media for games. Davis spoke to the folks behind Limited Run Games, who produce, guess what, limited run physical copies of digitially distributed games. On the other end of the market is Super Russian Roulette, a new game being produced as a cartridge for the very old Nintendo Entertainment System. Its a strange scene and it will be interesting to see if this is the start of a larger trend in games. Rounding out our features, we have a bit of urban horror fiction from M. E. Purfield which I am sure you will enjoy if you have ever had loud neighbors. Our regular pool of columnists is also in the house. Gavin Craig cheats on his backlog and plays a game that just came out (the scandal!). Meg Condis checks out the juvenile sports documentary At All Costs. Casey Lynch delivers his usual mountain of metal recommendations. Brock Wilbur’s second Monster Closet tackles the very first, very odd Ubisoft game. Corey Milne’s fed up with World War II games from the perspective of American heroes. Matt Marrone’s fed up with his local subway stop. I took a vacation on the spooky shores of Rusty Lake. Rob Rich defends the videogame pre-order. And, finally, Jason McMaster learns a valuable lesson about taking free samples and files a column about stimulants and videogames. All that, plus art from the fantastic Graham Curfield, Team Unwinnable’s monthly recommendations and a new crossword from Brian Taylor. That should keep you busy until June, right?